Finding the funds for your college education may seem like a long lost journey with no end. However, financial aid opportunities may be closer than you think, and qualifying them is not out of your reach, either. In fact, Arkansas is devoted to helping residents pay for their college education regardless of age, professional or marital status. The state funds scholarships and grants that you can apply for based on merit, need, or special circumstances. We want you to have access to all these opportunities, and more. Let’s start by looking at the four steps every Arkansas resident should take to fund a college education. Your financial aid journey starts at the top: by filing the FAFSA with the federal government. Don’t worry, it’s not as daunting as it sounds. FAFSA stands for Free Application for Federal Student Aid, and is the standard form used by college applicants across the nation to determine financial aid eligibility. The form is super long, so you’re going to want to ask questions or refer to our helpful guide along the way. If you’re losing steam, remind yourself that multiple other college applicants are feeling the exact same way. And, remind yourself that completing the form will pay off, literally. The earlier you submit the FAFSA, the larger your chances are to qualify for financial aid. Many scholarships are awarded on a first come, first serve basis, or have early application deadlines, so get started! Once you’ve submitted the FAFSA, you may find that you’re eligible for some government aid. But, don’t stop there! Arkansas provides additional state-funded scholarships and grants that you can apply for as well. Academic Challenge Scholarship for Arkansas residents with a minimum ACT score of 19. Governor’s Distinguished Scholarship for a maximum of 375 distinguished scholars. The scholarship is based entirely off of merit, not financial need, and awards up to $10,000 a year for tuition, mandatory fees, and room and board. Law Enforcement Officer’s Dependent Scholarship (LEO) for children and spouses of law enforcement officers killed or permanently disabled in the line of action. Military Dependent’s Scholarship for children or spouses of Arkansas veterans who were killed or permanently disabled in the line of duty. Arkansas Single Parent Scholarship Fund (ASPSF) for single parents who have earned a high school diploma or GED but have not previously completed a Bachelor’s degree.The fund aims to decrease the number of single-parent families that are currently below the poverty line by offering single parents financial and personal support for a college education. The ASPSF requires a FAFSA submission and a separate ASPSF applications that may differ between counties. Student Undergraduate Research Fellowship (SURF) for students conducting in-depth research projects in their specific fields of study. This scholarship is open to all majors and funds travel for the students to present their accomplishments in research. Students with a minimum GPA of 3.25 who have completed 30 or more credit hours towards their degree are encouraged to apply. Arkansas Future Grant (ArFuture), also known as the Go! Opportunities Grant, is for students pursuing an associate’s degree or certification in a STEM or regional high demand field at participating institutions. Recipients will receive monthly mentoring and are required to complete at least 15 hours of community service per semester. The grant is administered on a first come, first serve, basis and will provide supply full tuition fees aside from that already covered by scholarships and aid. Arkansas’ Department of Higher Education provides a list of scholarship and grant offerings here. In order to secure as much financial aid as possible, you are going to want all the help you can get. This may mean taking advice from your legal guardian – sigh – or visiting your high school guidance counselor. It is important to schedule regular guidance appointments to stay up to date on local scholarships and grant opportunities. Your counselor can help you find and apply for scholarships, and may be able to tell you about an opportunity you hadn’t known existed. They won’t be of much help, however, if you forget to show; so we recommend setting a reminder in your phone when you schedule your appointment. Conducting some online searches can connect you with scholarship and grant opportunities as well. Arkansas Department of Higher Education encourages students to use YOUniversal to search for and manage scholarship applications. The site helps you apply for scholarships and keep track of your applications and eligibility status. Additionally, Arkansas residents can search for specific scholarships on Fund My Future by plugging in criteria such as location, school, major, interests, and disabilities. You can also apply for scholarships directly through private organizations such Arkansas Community foundation, Arkansas Farm Bureau and Arkansas Student Loan Authority. If you’ve followed steps one through three and still need additional financial aid, it may be time to think about a private loan. Our free NitroScore tool can help you find out just how big or small of a loan you need, and which of our highly vetted loan partners can offer you the best rate. The tool is quick and easy to use – unlike some other checkpoints in the financial aid process! 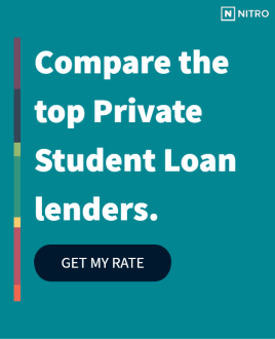 All that you need to do is type a school and major into the required boxes, and the tool will calculate a score that estimates your loans needed, and how easy they will be to repay based on your projected salary after graduation. From there, play around with different college/major combinations, and customize your results based on scholarships, grants, and savings that you currently have or expect to receive. Funding your future is in your reach. Start your financial aid journey today!